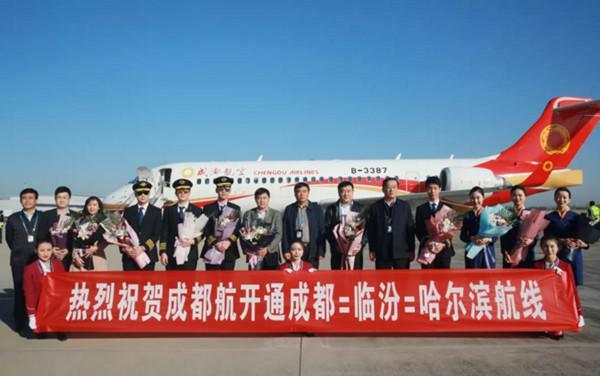 Chengdu Airlines opens three new routes operated by ARJ21__Commercial Aircraft Corporation of China, Ltd.
ARJ21 aircraft completed its maiden trip in the route of Chengdu=Linfen=Harbin on October 28th, 2018. The flight schedules for winter and spring seasons of China civil aviation industry was released on October 28th, 2018. Chengdu Airlines opened three new routes operated by ARJ21 aircraft, which are Flight EU6661/6662 of Chengdu=Hengyang=Quanzhou (on Monday, Wednesday, Friday and Sunday), Flight EU6663/6664 of Chengdu=Taiyuan=Harbin (on Wednesday, Friday and Sunday), and Flight EU6669/6670 of Chengdu=Linfen=Harbin (on Monday, Tuesday, Thursday and Saturday). According to Chengdu Airlines, the routes to be operated by ARJ21 aircraft in the new seasons also include Flight EU6665/6666 of Chengdu=Changsha=Shanghai Hongqiao (on Tuesday, Thursday and Saturday), Flight EU6673/6674 of Chengdu=Shangrao=Zhoushan (every day), Flight EU2789/2790 of Harbin=Wudalianchi (every day), and Flight EU2795/2796 of Harbin=Heihe (every day).